Stanley’s Plan looks and feels like it has come straight from the 1960s: sturdy pages, strong colours, bold outlines, simple settings, irresistible. Stanley is always hungry—like any self-respecting dog. There is a tasty treat on the top shelf luring him with its delicious aroma but he can’t reach it by himself. So Stanley devises a plan to get it down. However, Stanley’s friends are surprisingly unhelpful despite each fool proof solution Stanley works out. 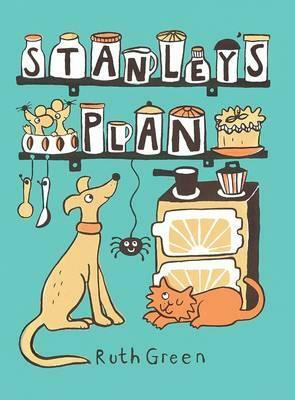 Little does he realise his friends have a surprise of their own in store for Stanley. Sweet, simple, like taking a step into the past: a wonderful introduction to story and suspense for toddlers.